While the responsibility obviously lies with the individual to make healthier soft drink selections, there is also an onus on food and drink outlets to offer the range and information to enable customers to choose what they are seeking. Entering into the build up to Christmas and more importantly into the New Year, we are surrounded by the usual predictable array of diet, exercise and eat healthier adverts. Clearly many take notice of these or the advertisers would not do them year in and year out. However, where do soft drinks, juices and smoothies fit in this? Despite sugar claims, juices and smoothies continue to offer a healthier option, particularly as smoothies are created from whole fruit, so are also packed with fibre. The high street is also seeing a significant shift to offering smaller ‘super shots’ smoothies. Often featuring super foods such as spinach and kale, these are becoming more and more prevalent. Cleverly packaged in smaller bottles, these are being marketed as an instant healthy energy boost and often reflect a premium price. Undoubtedly this needs to also be reflected in a B&I catering outlet where the range of soft drinks, juices and smoothies should include these types of smaller, vitamin packed drinks. However, with time of the essence the popularity of smoothies and super shots means unless it is a dedicated smoothie venue it is unlikely to be able to offer fresh, unusual flavours due to the wide range of raw ingredients required, which often go out of date before being used. It therefore makes sense to source juice and smoothie suppliers with an ever increasing range of flavours, where catering managers can buy their drinks in, rather than making them fresh. Particularly, as contrary to the wastage created from making from fresh these types of product can be stored unopened in ambient storage and once opened even stay fresh for up to 30 days, if chilled. In addition, it is important to quickly relay the benefits these choices offer. People are often making rapid food and drink decisions. 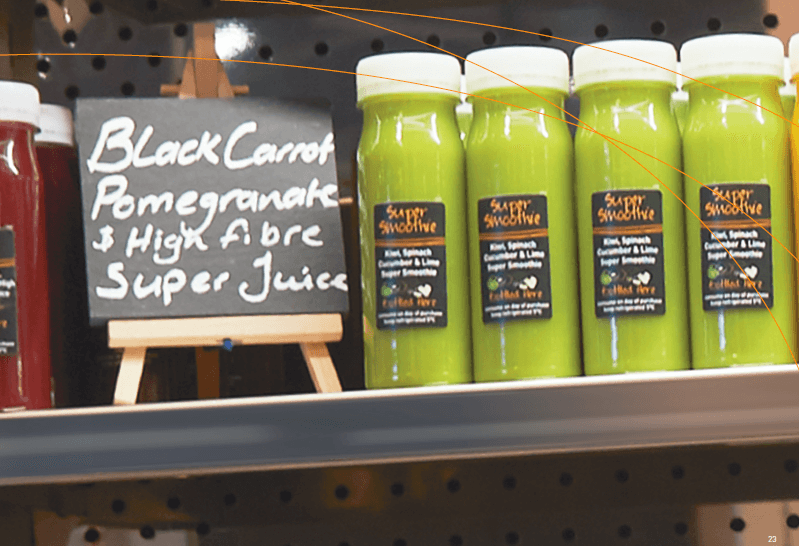 With more and more intriguing flavours entering the realm, such as kiwi, spinach and cucumber or even mango, bell pepper, carrot and cucumber smoothies, customers need to instantly identify with both the flavour, but also with what it offers them from a health perspective. This is where point of sale materials or menu boards can help by also highlighting whether the drink simply boosts hydration; is a mood buster, provides a specific vitamin or offers anti-ageing properties.